It is always a joy to be at Chez Castillon. Next course up – could it be for you? – Write and Sell Short Stories. 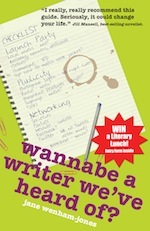 Write a short story for Woman’s Weekly – and get personal feedback from their fiction editor – or a prize-grabbing entry for a competition. 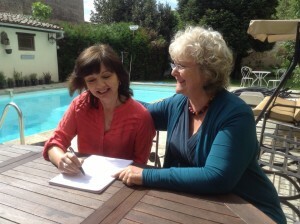 Coming soon – Writing Crime with lovely Clare Mackintosh and Pitch and Sell Your Novel avec moi :-). For details of all courses see here. To give you a flavour of what to expect I’d like to share a post from Lynne Shelby, winner of the Accent Press and Woman magazine novel competition who blogged about her experience at Chez Castillon, in May. You can read the original – and find out more about the fabulous venue – at http://www.chez-castillon.com/437/champagne-de-romance-at-chez-castillon. It’s market day in the small French town of Castillon de Bataille. Writer’s notebook and camera in hand, I edge through the crowds gathered around stalls selling fish and meat, fresh herbs and spices, and dresses fluttering in the breeze like brightly coloured flags. Later, I am to write an atmospheric description of the market through the eyes of a character in my WIP. Days at Chez Castillon begin with a breakfast of fresh croissants and baguettes from the local boulangerie (I could get used to this!). Then I and my fellow writing students, Sue, Mary, Helen and Peter, spend the morning in the “classroom” with our inspiring and insightful (and patient!) tutor, Jane Wenham-Jones. Janie and Mickey who run Chez Castillon are wonderful hosts. As well as being a writer (her novel, Life’s A Drag, is published by Accent Press), Janie is a superb cook, and for lunch and dinner, all the students, and the writers in residence, Katie Fforde, Judy Astley, Catherine Jones (writing as Fiona Field), Jo Thomas and Clare Mackintosh, gather in the dining room for delicious food, fabulous wine and much laughter (I do like being a writer!). Today, after lunch, best-selling novelist, Katie Fforde, one of the judges of the Accent Press and Woman Writing Competition, helps me with my WIP. I sit by the pool in the sun, holding my breath while she reads my work, and I’m so thrilled and delighted when she likes it. She very generously shares her expertise and knowledge, and gives me some invaluable advice on how to sort out my plot. Also at Chez Castillon this week is David Headley of DHH Literary Agency. Jane helps me, Sue, Mary, Helen and Peter work on the pitches for our books, which we then present to David for feedback. I’m very encouraged by his appreciative interest in my WIP. It’s such a great opportunity to hear what a top literary agent looks for in a submission and to learn a little more about publishing. My first visit to Chez Castillon goes all too fast. It’s been an inspiring and exhilarating week of writing, with great food, great wine, and above all great company – and so much fun. And what better way to toast a gathering of writers that includes romantic novelists than with Champagne de Romance? Santé. If you’d like to be inspired by the beautiful Chez Castillon and its writers in residence, why not join bestselling novelist and tutor Jane Wenham-Jones in October?